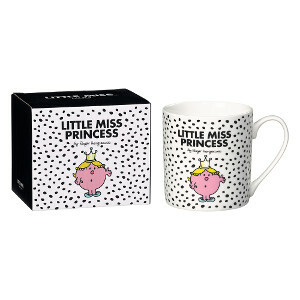 Character mug featuring Little Miss Princess on a black and white patterned background with a quote on the reverse. Presented in an illustrated gift box. Mr. Men and Little Miss come in all shapes and sizes. Pick your character and make a statement with these new bone china mugs. Dishwasher and microwave safe.